This Witch Hundred Knight Figure is Colorful Indeed! I love this Witch Hundred Knight figure. I have not played the game but that isn’t the reason to get this figure. You want to get this figure because of how amazingly colorful it is. It has all the blues and yellows, reds and greens. It just pops. I love it. She is made by Good Smile Company and is 1/8 scale. If you’re in a hurry you can buy her right here! There is a lot going on with Swamp Witch Metallia! I love that this Metallia witch has a lot going on. There is definitely plenty to look at. It includes a base, the figure herself, a broom, the knight, her hat, a clear plastic peg, and a dagger too. The base is awesome. It has the swamp sludge, grass, plants, mushrooms, little creatures, pumpkins, and the broom is part of it as well. You can attach the dagger that comes with the figure to the base. They definitely put a lot of thought into it. A lot of figures don’t go through with this much effort to make the base fit the character. Instead, they usually do a plain boring base but, this one fits very well with the character! Let’s take a closer look at the Swamp Witch! Her hat is kind of monster-ish. It has little teeth, an eye, and a rainbow colored tail! You can add it or remove it from Metallia. I love her hair because of how wavy and crazy it is. It’s pretty spiky and detailed. I dislike the plastic piece holding up this figure but, luckily it’s not that distracting because of how much other stuff is covering it up. You barely even notice it! There is some minor assembly but, it’s all easy stuff. Things like attaching the figure to the base, attaching the broom to the base, and the dagger. You also need to put the knight in her hands. Adding the hat to her head. All simple things. Metallia is a one of a kind figure! I haven’t seen any figures with so much going on before. Overall this figures tone is very playful and full of color. She seems very light like she is floating and she seems pretty mischievous too. This is definitely one of the most colorful figures out there! 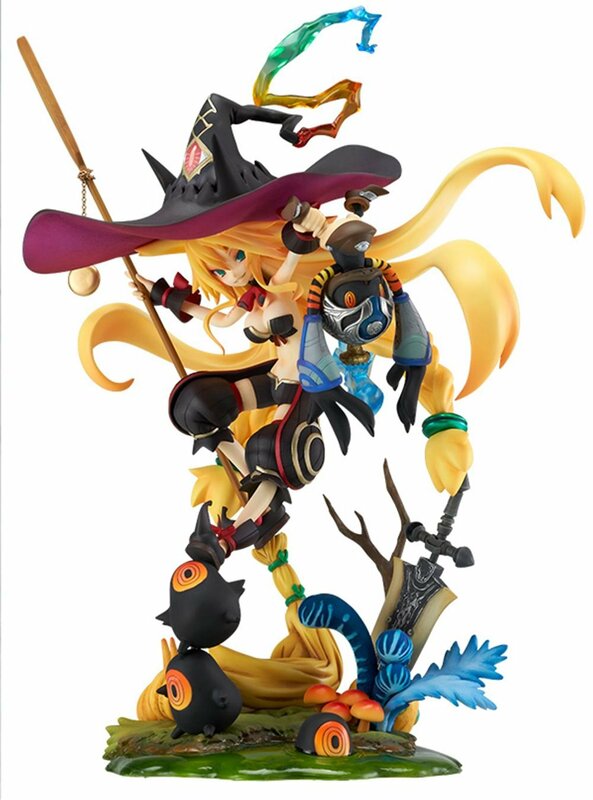 It’s a Witch Hundred Knight Figure that is worth getting.